You have heard of the social media spat between Samuel L Jackson and Donald Trump right? 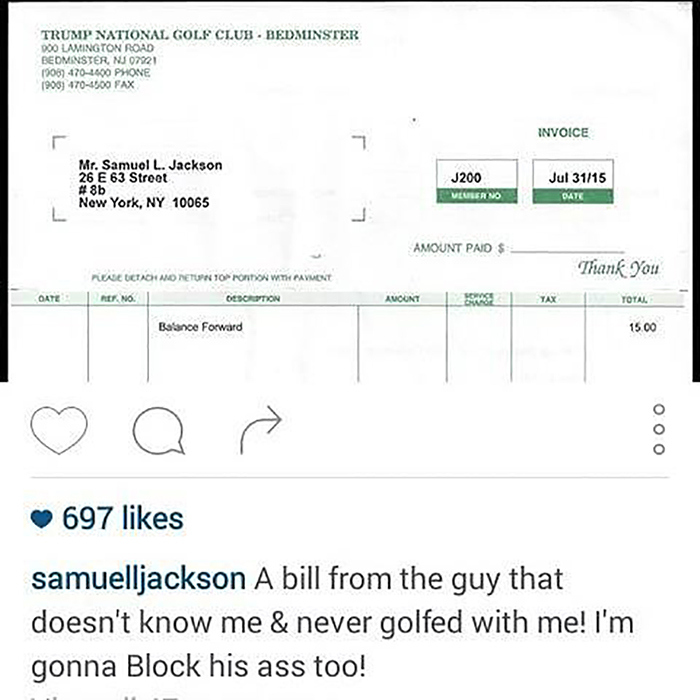 Basically Trump said he never even heard of Jackson and in true Tarantino fashion, Samuel came out all guns blazing. Samuel L. Jackson responded to a claim made by Donald Trump that he had never met the actor by producing a bill (on instagram) he received from the presidential hopeful's golf club. 'I don’t know Samuel L. Jackson, to best of my knowledge haven't played golf w/him & think he does too many TV commercials—boring. Not a fan,' Trump tweeted on Tuesday after Jackson implied he cheated at golf in an interview. But now it turns out the pair have actually met before. A video has emerged of the pair discussing spending the night in each other's company. It didn't go well. After Donald Trump said he didn't know who Samuel L Jackson was a video has emerged proving the pair actually have met before and it didn't go well!